To celebrate my friend’s birthday, a couple of my girlfriends and I took off to a small town called Mudgee. Since Monday was a public holiday we decided to make the most of the long weekend. My friend Sam suggested we visit Mudgee; a small country town in the middle of New South Wales, about a 3-hour drive from Sydney with lots of tiny wineries. We rented a house through a friend of a friend so we decided to drop our stuff off and scout the place out. After a few wrong turns, we eventually made our way to the end of a long dirt road. We turned up to what seemed like a large but very dilapidated property. Looking at each other wearily, we made our way through what felt like a construction site. Luckily the inside looked like a beautiful log cabin. It had individual rooms for all of us, two bathtubs and a cozy fireplace. It was exactly what we wanted. We all squealed in excitement, each of us darting off to snoop our home for the next two nights. While I sat by the fireplace trying to get it started, the guy who owned the house turned up. His name was Adam, a 25-year-old country boy who lived his whole life in Mudgee. He stood at the doorway, looking slightly intimidated, as we all filed out of his bedrooms and gathered in the living room to introduce ourselves. “Hi Adam, my name is Kim, I’m from Canada.” He smiled politely, “hi Kim, nice to meet you.” The rest of the girls shook his hand, telling him their name and where they were from. South Africa, California and Canada. He laughed in disbelief, “I’ve never even left Mudgee!” We all laughed, “well we’re bringing the world to you!” Claudia chirped back. That night we went to a restaurant for dinner and more wine tasting. We met a wine merchant who explained the process of making wine. I swung the red wine in my glass as he spoke, looking closely at the “legs” that dribbled down the side, thinking to myself what a long procedure it went through to get into my glass. We had a few more tastes and then decided to order some dinner. A live band started while we ate so we finished quickly and made our way to the front of the restaurant to watch the band. We joined a little boy who danced wildly while his family laughed and cheered him on from their dinner table. He exuberantly basked in the attention, each dance move became more and more creative than the next. After a few songs, we decided it was time to head to the bar up the street and continue dancing. When we arrived the dance floor was empty but we didn’t care, we threw our purses on an empty chair and danced like crazy until the whole dance floor filled up with people. We returned home late and exhausted. Laying by the fire, we talked until our eyes became sleepy and we all filed off to bed. The following day, Adam picked us up bright and early. We rose, slightly hungover but excited for the day ahead. Lisa made us some pancakes and played the song “Banana Pancakes” by Jack Johnson. We all sung along softly while we lazed about the house. On our way into town, we stopped by a coffee shop then drove to our first winery. What I found most interesting were the people behind the wine. Wine to them was an art, it was their creative outlet. 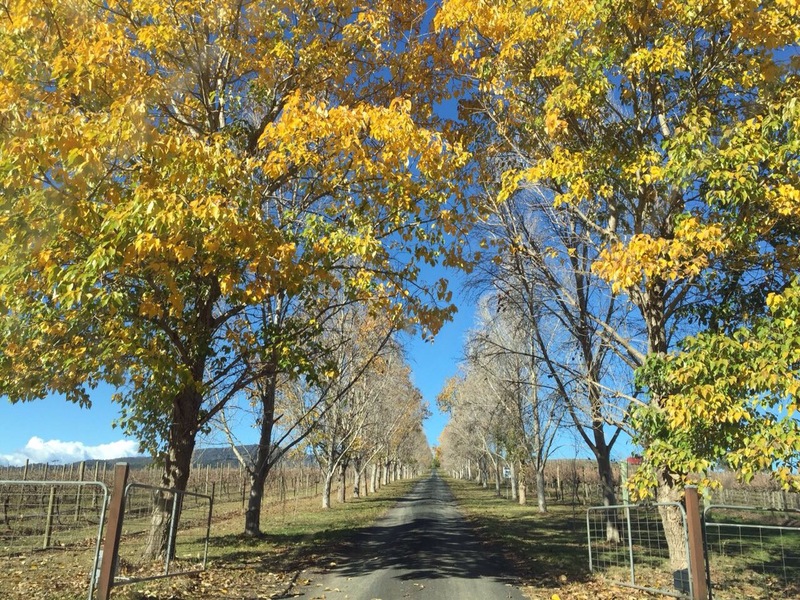 We met people from all over the world who had fallen in love with Mudgee. We met a large, outgoing South African woman with jet black, pixie cut hair. When she learned my friends were South African she excitedly darted over to us and began speaking Afrikaans. Oblivious to what they were saying, I stood there watching them as the spoke, completely mesmerized by their language. Eventually, she switched to English and explained how happy she was to live in Mudgee. “I have everything I want here, it’s quiet and peaceful and good for the soul.” I scanned out at the view, it was a large barren field with a few cows speckled in the distance. I wondered if I could live a life like this. It certainly did seem peaceful and quiet and good for the soul. Unlike like living in the city, it was simple and slow and uncomplicated. I can imagine how rewarding it must feel to make your own wine; to experience the hard work of farming and harvesting your grapes then having the luxury of sitting back and slowly sipping the fruits of your own labor. It made me think about my own life and how it compares. In some ways, I loathe the busy and time-poor lifestyle that a big city demands of you. But in other ways, I love the surge of energy and ideas and excitement that comes with that too. The demand to keep up with its pace keeps me on my toes, it keeps my brain active and stimulated. After a day full of wine we ended up at the same bar for dinner. I felt like being creative so I grabbed some crayons and paper that was laying on the counter and brought it to our table. Without a word, everyone reached for a crayon and quietly began colouring like we were children again. I smiled watching the girls concentrate on their work. Adam’s friends walked by and noticed us all drawing and teasingly nudged his arm. Once we finished our meal, we sat back in our chairs and decided we’d head back home. We changed into our pajamas, sat in front of the fire and got lost in a discussion on life, love, and travel. Our final morning in Mudgee was spent at a cheese and wine restaurant. We sat on a patio outside in the sun and pulled down the umbrella to bask in the winter sunshine. It was incredibly warm and I finally had the chance to zip off my winter coat. I leaned back in my chair and closed my eyes as the warm sun absorbed into my skin. I sipped my unbelievably delicious cappuccino and felt so incredibly grateful for my life. Just when things couldn’t get any better, our cheese plater arrived and an acoustic guitar player began to play. It was a perfect getaway from Sydney; just enough time to gain perspective on life and get some nature time. It was so nice to spend quality time with my amazing, independent and inspiring girlfriends. The whole trip just reminded me of the important things in life: loving friendships, delicious cheese, music and of course, wine! What a great experience and even better that you do so very much appreciate it.